Researching the Gregorian Calendar Reforms involves a journey into the mire of mainstream medieval manuscripts and academic assertions that so inspired J R R Tolkien when he was a Professor of Anglo-Saxon between 1925 and 1945. Venturing into this swamp is an adventure. You never known what you might encounter. Lurking in the depths is the Comet Halley Calendar. This remarkable object is hidden in plain sight under layers of mainstream misdirection. The Comet Halley Calendar is a straightforward chart tracking the number of years between each appearance of Comet Halley in the inner Solar System. The thousand years between 700 and 1700 AD include a very striking head and shoulders pattern [red trace] that rises above the body of Comet Halley observations [yellow trace]. In general terms, the head and shoulders pattern for Comet Halley ranges between 77 and 79 years while the body ranges between 75 and 77 years i.e. a two year difference in ranges. This natural variability is very curious. The mainstream suggest “Jupiter and Saturn” cause an orbital “retardation”. However, the mainstream is not so forthcoming when it comes to explaining away the remarkable recovery of Comet Halley from a sluggish 79 to a surprisingly sprightly 75 year orbital period. Halley’s prediction of the comet’s return proved to be correct, although it was not seen until 25 December 1758, by Johann Georg Palitzsch, a German farmer and amateur astronomer. It did not pass through its perihelion until 13 March 1759, the attraction of Jupiter and Saturn having caused a retardation of 618 days. Then there’s the curious coincidence of Comet Halley’s head and shoulders pattern coinciding with the Earth’s orbital excursion between 914 and 1409. This curious coincidence has Comet Halley enduring extended excursions into cold space while the Earth [contrarily] basks in a bountiful Medieval Warm Period. Evidence has been accumulating in many fields of investigation pointing to a notably warm climate in many parts of the world, that lasted a few centuries around A.D. 1000–1200, and was followed by a decline of temperature levels till between 1500 and 1700 the coldest phase since the last ice age occurred. The Medieval Warm Period suggests the Earth’s orbital distance from the Sun was reduced during it’s orbital excursion and this implies the number of days in an Earth Year were similarly reduced. Following this line of reasoning leads to the conclusion Comet Halley’s extended head and shoulders return periods are an observational illusion. Comet Halley didn’t experience an orbital excursion. Comet Halley’s orbital period only appears to increase [from an Earthly perspective] because the Earth Year contained fewer days during the Earth’s orbital excursion. Quantifying the number of days in the Earth Year during the orbital excursion isn’t an exact science due to the limitations of the observational data, the oscillating nature of the return period and the limited number of data points. However, in whole numbers, an indicative estimate can be established by assuming the head and shoulders pattern of Comet Halley had an average return period of 78 years while the body pattern averaged out at 76 years i.e. a difference of two year. This appears to be a fairly realistic estimate. If two years are subtracted from the return period [between 912 and 1409 AD] then Comet Halley’s orbital period acquires a fairly regular [but slowly declining] heartbeat. This estimate indicates the shortened Earth Year contained 355 or 356 days. Intriguingly, an Earth Year of 355 days would align fairly well with a lunar calendar. The Islamic, Muslim, or Hijri calendar is a lunar calendar consisting of 12 months in a year of 354 or 355 days. It is also used by Muslims to determine the proper days of Islamic holidays and rituals, such as the annual period of fasting and the proper time for the pilgrimage to Mecca. The so-called “Calendar of Coligny” is a fragmented bronze plaque that was found in 1897 in the remains of a Roman Temple of Apollo in Coligny, Ain, France. The estimated difference of between 9 and 10 days in the Earth Year is very close to the 10 day calendar adjustment implemented by the Gregorian Calendar Reforms. Is this confirmation the Gregorian Calendar Reforms marked the final transition from a lunar calendar of 354–355 days to a solar calendar of 365–366 days? The epact was described by medieval computists as the age of the moon in days on 22 March; in the newer Gregorian calendar, however, the epact is reckoned as the age of the ecclesiastical moon on 1 January. Its principal use is in determining the date of Easter by computistical methods. It varies (usually by 11 days) from year to year, because of the difference between the solar year of 365–366 days and the lunar year of 354–355 days. Two factors led to the creation of three new forms of the epact in the Fifteenth and Sixteenth centuries. The first was the increasing error of computistical techniques, which led to the introduction of a new Julian epact around 1478, to be used for practical computations of the phase of the Moon for medical or astrological purposes. 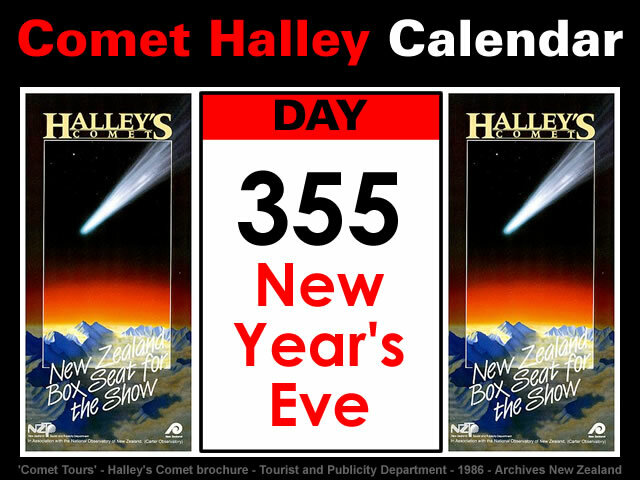 The Comet Halley Calendar is important. The Comet Halley Calendar provides a very curious and unexplained data anomaly during the “900-year near-stagnation of the Middle Ages” promoted by the Gradualist mainstream. The author devotes his first three chapters to pre-Copernican astronomy, covering primitive views, the speculations of the Greek astronomers from Thales and Pythagoras to Hipparchus and Ptolemy, and the 900-year near-stagnation of the Middle Ages. The Comet Halley Calendar provides the data that demonstrates the Earth’s temporary warming during the Medieval Warm Period provided the additional heat necessary to trigger the Catastrophic formation of the Greenland Ice Sheet. A remarkable aspect of the 1969 chronology for Camp Century is that it is based entirely upon mathematical modelling and excludes the “reasonable interpretation of physical stratigraphy” that was incorporated into the Site 2 methodology. This cornucopia of Settled Science is also truly remarkable because a Camp Century stratigraphy [based upon the uppermost 100 metres] detailed in a δ18O study [from 1977] very strongly suggests the Greenland Ice Sheet formed in 945 AD. Saint Juliana of Nicomedia is said to have suffered Christian martyrdom during the Diocletian persecution in 304. She was popular in the Middle Ages, especially in the Netherlands, as the patron saint of sickness. The Acts of Saint Juliana used by Bede in his “Martyrologium” are not at all legendary. According to this account, Saint Juliana, daughter of an illustrious pagan named Africanus, was born in Nicomedia; and as a child was betrothed to the Senator Eleusius, one of the emperor’s advisors. Her father was hostile to the Christians. Juliana secretly accepted holy baptism. 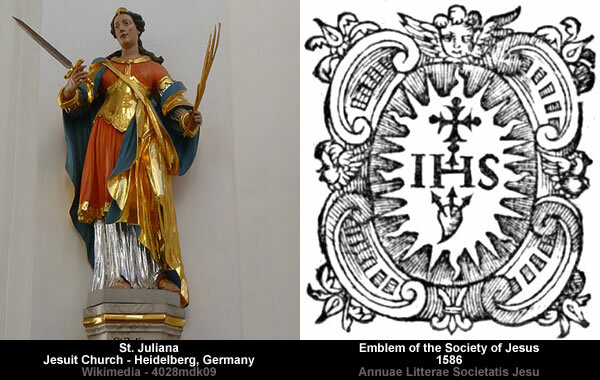 Sankt Julian (often rendered St. Julian) is an Ortsgemeinde – a municipality belonging to a Verbandsgemeinde, a kind of collective municipality – in the Kusel district in Rhineland-Palatinate, Germany. The settled area around Sankt Julian is very old. The old church tower shows some Roman spolia. It could be that the church was built on the same site as an earlier Roman temple, and it is therefore easy to see that the builders would have salvaged bits of this old building for the church. Further bearing witness to a Roman presence are Roman soldiers’ and traders’ graves along with gold coins from Emperor Constantine’s time. 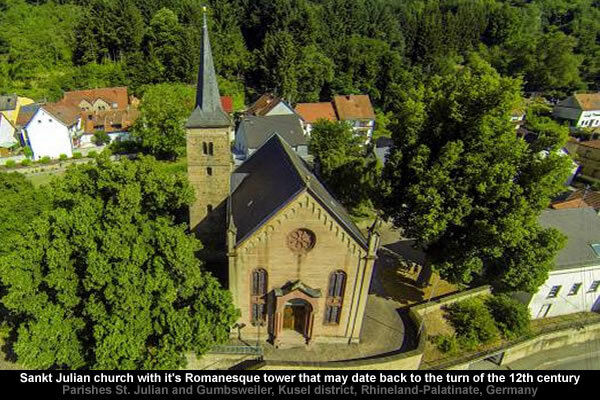 It is unknown when the tower that still stands now at the old Romanesque church in Sankt Julian was built, but going by its stylistic elements, it might have been sometime about the turn of the 12th century… About 1290, a priest named Conrad worked in Sankt Julian, a well-to-do man who endowed a chapel to hold Saint Juliana’s relics, which was built right next to the then Romanesque church. … Sankt Julian was a well known pilgrimage centre in the Middle Ages. The pastor of Sankt Julian was also the vicar at the Offenbach Monastery. The Reformation might originally stem from a “schism” between conservative lunar and progressive solar sects i.e. the more things change, the more they stay the same. The Reformation, specifically referred to as the Protestant Reformation, was a schism in Western Christianity initiated by Martin Luther and continued by John Calvin, Huldrych Zwingli, and other early Protestant Reformers in 16th-century Europe. Gallery | This entry was posted in Astrophysics, Comets, Earth, Glaciology, Great Greenland Snow Job, Greenland, Heinsohn Horizon, History, Inflating Earth, Moon, Old Japanese Cedar Tree, Science, Solar System, Uniformitarianism. Bookmark the permalink. There is another very important possibility – That the Earth’s orbit did not change but that during this Medieval period the Sun was emitting more energy and heat. Isn’t the Jewish calendar also a lunar calendar?